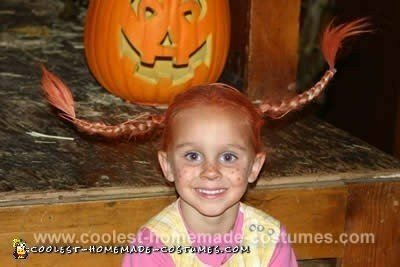 Lindsey (five years old) is crazy about Pippi Longstocking and decided that’s who she was going as this year. 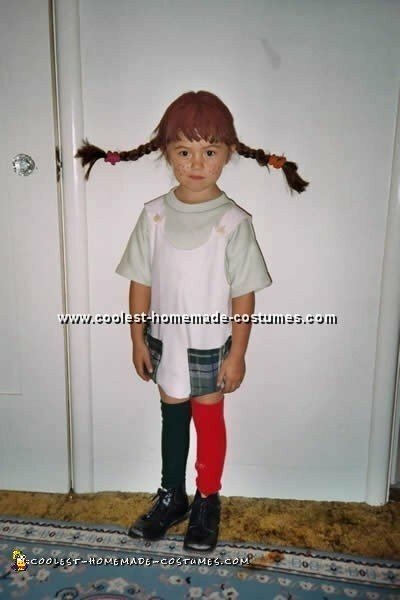 She had watched the DVD from the library and from that moment on it was a Pippi Longstocking costume. I bought a blue jumper on eBay and then got the red shirt at the thrift shop. I sewed miss-matched patches on the dress and glued red felt on to write Pippi on the front. We added mismatched striped socks (Wall-mart) and her black boots. For her hair I used 16 gauge wire and braided her hair around that. I used some hairspray to hold it in place better too. Then I sprayed her hair with orange temporary color. For a final touch we added a few freckles with the brown eyeliner pencil. She had to have a Mr. Nilsson doll of course so we took one of her monkeys and I sewed a little outfit for him out of green felt. She got many compliments and a few people asked if that was her real hair color. It was fun and I’d think she’d dress up in her Pippi Longstocking costume every day if she could! I bought the denim dress at our local Goodwill shop for only $5.00. To create the patches on the dress, I cut squares out of two old shirts. I glued them on with fabric glue and it worked great. That process only took a matter of minutes. I bought a pair of purple and black striped tights from Party City and then bought a two pack of socks that were a solid pink and solid purple from Target. I had my daughter wear one of each color over the tights so that she could be mismatched. She wore a t-shirt underneath the dress that she already had to complete the dress. For her hair I braided two pigtails and then cut a wire hanger to the length of what her pigtails were when they were pulled straight out. 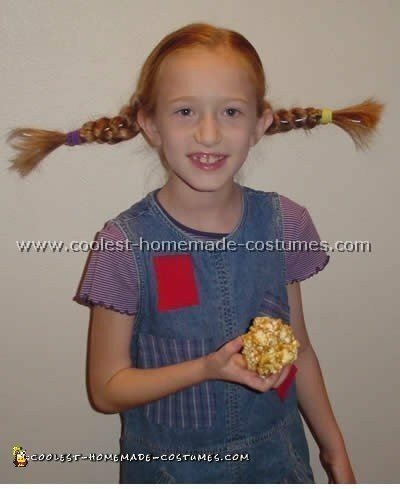 I then slid the hanger through the back of her hair and through each pigtail giving her the Pippi hairstyle. She got a lot of wonderful compliments on her Pippi Longstocking costume (especially her hair). When she went trick or treating everyone knew who she was! This was the best costume she has had to date and by far the least expensive. I was thinking of how to make something work for a Halloween party I had to go to without spending a lot of money. 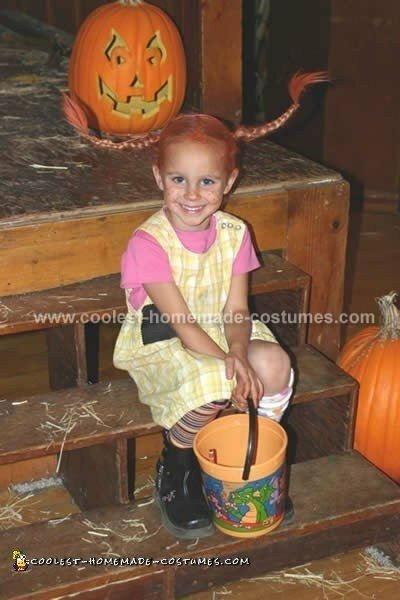 A Pippi Longstocking costume came to mind because she was a favorite of mine when younger. I went shopping in a second hand store for a dress. I cut the bottom of jumper then I cut off sleeves from a shirt for socks. For the guarder belts, I used sheet holders. Then I glued felt and pieces of material to different areas of dress. I found a red wig that was cheep because it was opened in the store. I made pig tails then wired them. Used my grandson’s monkey and just safety pinned him to shoulder of dress. Be Cheeky and Wild and Wonderful! My wife and mother-in-law hand made this simple but cute Pippi long stocking costume. My daughter was in love with Pippi when she was small and is going dressed in a Pippi long stocking costume again this year. Kendall LOVES Pippi Longstockings (she acts a bit like too!!) so this was a great costume for her! We bought an old jumper at the Salvation Army and quickly basted some mismatched patches cut from old fabric scraps. You could even hot glue them if you’d like! We also made a front pocket for Mr. Nilsson the monkey (not shown). Cost for this step: $3.00! Next, we bought two pair of tights and cut one leg off of each of them. I made a “garter” out of elastic with buttons at the bottom of the leg straps. It was more or less a waist band with a piece going down the outside of each leg. ext, I cut a “button hole” on the outside thigh of each of the legs I’d cut from the tights. I braided Kendall’s hair over a coat hanger I’d bent to the shape of her head and sprayed it all with orange hairspray. I paired the costume with an old pair of her boots and an old tee-shirt. and used my eyeliner to make freckles. Total cost for this project was only about $13-$15 dollars! ….So I Think I Can Definitely Do It! For this costume, I bought the fabric on clearance for the jumper and bloomers and made these myself. I have sewn before but, let’s put it this way, I just “pretend” to know how to sew! I fake it and somehow it works. The red shirt was old knit (adult) pajamas that I sewed to make smaller but still oversized because I wanted it to hang lower than the jumper. I also layered a T-shirt underneath. The stockings of the Pippi Longstocking costume were just knit mismatched adult knee-highs. To make her dark blonde hair a reddish-orange, I used Revlon’s fanciful “Lucky Copper” mousse. I put it on dry hair hoping the color would show better. I would have liked a little more color to show (was actually more red in person), but I didn’t want to use the hairspray color because it is too powdery and messy. In order to get Pippi’s trademark standout braids – I fished a 16 gauge copper wire through her braid, around the back of her head, and thru the other braid. Lastly, Mr. Nilsson the monkey: I dressed him in old doll clothes. The hat I made out of a small cardboard ice cream cup, covered with paper bag, then a paper plate also covered with “wet” paper bag. I put the two pieces together and did a wash with watered-down yellow paint to make it look straw-like. I poked 2 holes on each side and wrapped a shoestring around and down thru the holes and secured with a bow or knot under his chin. This Pippi Longstocking costume came out great! Pippi is everyone’s childhood favorite. My daughter is now enjoying that same beloved book and television character, as I did. 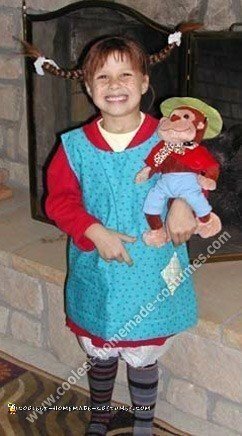 The dress, shirts (a red and a blue one) and shoes (boys shoes are best to achieve the look) of the Pippi Longstocking costume were purchased at a child’s used clothing store, all for less than $15. I sewed three patches onto the Pippi Longstocking costume dress from fabric scraps. We used baseball pants as bloomers and bought the mismatched knee socks at the dollar store. I purchased 16-gauge wire available at hardware and craft stores to make her braids stick out. I pulled one side of her hair up in a ponytail while braiding the other with the wire, doing the same for the other side. The wire spanned across the back of her head. I created freckles with lip liner and topped off the Pippi Longstocking costume look with red-colored hairspray. 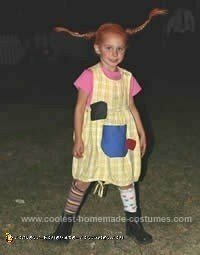 This Pippi Longstocking costume was very simple and she received many raves all night long. Mr. Nillson was a stuffed monkey with a straw hat (.49 at Walmart) dressed in old doll clothes; I hot-glued a bow onto the hat. Any true Pippi Longstocking fans, must check out this Pippi in a hot air balloon costume!